More about Termites and Ants - Champion Pest Management, Inc.Champion Pest Management, Inc.
Subterranean termites are social insects that live in colonies within the soil, hence their name “subterranean.” These colonies contain three forms or castes: reproductives, workers (pseudergates) and soldiers. Subterranean termites have several stages: the egg, larva, apterous workers (wingless), a brachypterous nymph (with wing pads), soldiers and adult swarmers. 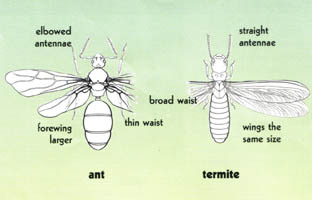 There are three forms of adult reproductive termites including primary, secondary and tertiary (Fig. 1a). Reproductive males and females can be winged (primary) or wingless (secondary or tertiary). Females of each can lay eggs and produce new offspring. The bodies of winged primary reproductives, also called swarmers or alates, vary by species from coal black to pale yellow-brown. Wings may be pale or smoky gray to brown and have distinct vein patterns used in identification. Reticulitermes swarmer termites are about 1⁄4 to 3⁄8 inch long. Secondary and tertiary reproductives live within the colony and are white to cream-colored. These termites form a backup for the primary queen and may replace her if she is injured or dies. These termites mate within the colony and lay viable eggs. If supplementary reproductives and worker termites become isolated from the main colony, they can establish a new sub-colony. Termite workers make up the largest number of individuals within a colony and do all the work. They are wingless, white to creamy white and 1⁄4 to 3⁄8 inch long (Fig. 1b). They forage for food, feed the other castes, groom the queen and maintain and build tunnels and shelter tubes. Their mouthparts are very hard and adapted for chewing through wood or other cellulose materials. The worker caste is responsible for the damage that makes termites an economically important problem. Soldiers resemble workers in color and general appearance, except they have well-developed brownish heads with strong mandibles or jaws (Fig.1c). Soldiers defend the colony against invaders, primarily ants and other termites. They cannot forage for food or feed themselves, and they depend on the workers to care for them. Ants and termites often swarm at about the same time of year but control measures for each differ greatly. It is therefore, important to be able to distinguish between swarming termites and ants. (Fig. 2). From wood debris left in crawl space.